Grounds from n.e. tower--for "Art and indust." Title: Grounds from n.e. tower--for "Art and indust." Notes: Architects: Main Exhibition Building -- Henry Pettit & Joseph M. Wilson; Main Building Annex (Carriage Annex) -- H.J. Schwarzmann; Memorial Hall -- H.J. Schwarzmann; Telegraph Office -- Balderston & Hutton; Department of Public Comfort -- Balderston & Hutton; Judges Hall -- Hugh Kafka; World Ticket Office -- H.J. Schwarzmann; Pennsylvania Educational Hall -- Peters & Burger. Notes: Titles on labels: From Main Building tower, and: Grounds from N.E. tower M.B. 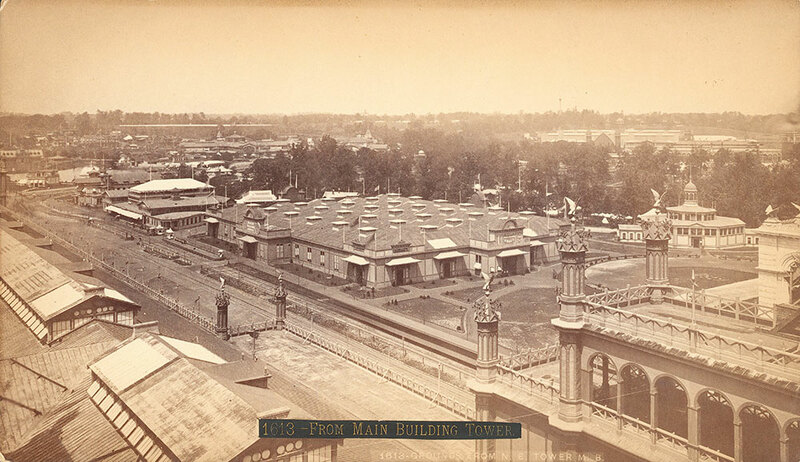 Notes: View from the Main Building of the Main Exhibition Building, Bldg. #1; Main Building Annex - Carriage Annex, Bldg. #106; Memorial Hall, Bldg. #101; Telegraph Office, Bldg. # 123; Department of Public Comfort, Bldg. #118; Judges Hall, Bldg. #109; World Ticket Office, Bldg. #84; and Pennsylvania Educational Hall, Bldg. #122.